Dancers of Portland based Northwest Dance Project. Eva Stone is trying to make people care about contemporary dance. A difficult task, especially when her festival, Chop Shop: Bodies of Work, takes place at the Meydenbauer Theater on the Eastside, where contemporary dance is rarely seen. “I’m deeply obsessed with the art form of contemporary dance,” she stated ardently, in a recent interview with SeattleDances. “But I’ve been in the business for 25 years and there are still people in my family who don’t understand what I do, and who don’t get it.” While most artists in general, and of course dancers specifically, can relate to this point, Stone is trying to rectify the issue by being the sole producer of Chop Shop, and bringing contemporary dance to the Eastside. “I’m trying to get people as obsessed as I am,” says Stone. As the festival celebrates its fifth year, this goal is slowly but surely being reached. 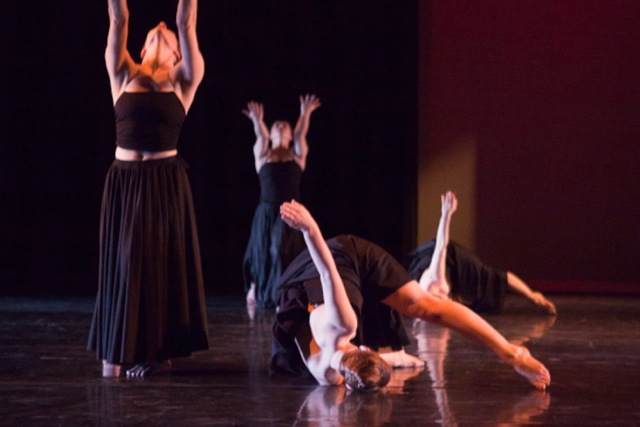 Chop Shop has become a highly anticipated dance event, and Stone has successfully created a platform for innovative dance works to reach new audiences. This year’s performances will take place on Saturday, February 11, 2012 at 7:30 pm and Sunday, February 12, 2012, at 3:00 pm. When Stone first started Chop Shop, she felt that there was a sharp division in the Seattle dance community between ballet and the super avant-garde, with very little middle ground. Stone felt that many artists were making work that wasn’t getting exposure, because it didn’t fit into those categories. “I wanted to make a home for them, get their work seen.” Having taught on the Eastside for 7 years, at both the Washington Academy of Performing Arts and International Ballet Theater, Stone had already developed quite a following among families and students. Since “there was no contemporary dance there at all…I was primed to take off from there.” Now firmly established, Chop Shop has grown considerably. Though it first featured only local artists and was relegated to a one-night-only performance, it has expanded to a two show affair, with master classes and lectures that demystify contemporary dance during the day. Stone explained her passion for dance by starting with a bold statement: “Dance doesn’t matter.” Slightly paradoxical for someone who’s made dance the focal point of her career, she qualifies her reasoning by explaining that compared with all the other problems our world faces today, dance is largely insignificant. Acknowledging this reality doesn’t deter Stone from being completely dedicated to dance, however. In fact, it seems to make her all the more determined to share her passion. “I’ll never forget the first flash mob I saw,” she says. “It was the one in a train station, for T-Mobile. I cried! I thought, ‘This is so silly and meaningless!’ but the world completely stopped, no one could take their eyes off what was happening, time and space didn’t matter.” The innate power and beauty in dance is enough to keep Stone intrigued. And it is this power to captivate and connect to people that Stone searches for when curating Chop Shop. When looking for work, “I have to see it and say, yes, my husband or mother-in-law would watch this and have a connection.” This isn’t to say that Stone tries to appease a potentially new-to-dance audience with only easily palatable works. The program presents enough variety to whet the appetites of seasoned viewers as well. This year’s big draws are New York choreographer Adam Barruch and Move: the company, from Western Canada. Barruch is a “brand new, up-and-coming, hot-off-the-press choreographer from New York.” Stone first saw his work on a dancer’s audition reel and knew immediately she had to have him. Having recently shown works at the JulliardSchool, SUNY Purchase, and Jacobs Pillow, Barruch is already in high demand; Chop Shop will be his West Coast premier. His movement “is definitely influenced by what’s happening in contemporary dance, but he has a beautiful trait of individuality,” says Stone. Barruch will be bringing one of his dancers with him from New York and will be presenting folie à deux, which explores the interior landscapes and unraveling of a relationship.